Hidden contemporary set in nature w/ mountain + tree top views. High ceilings w/ ample use of travertine, glass + stone throughout. 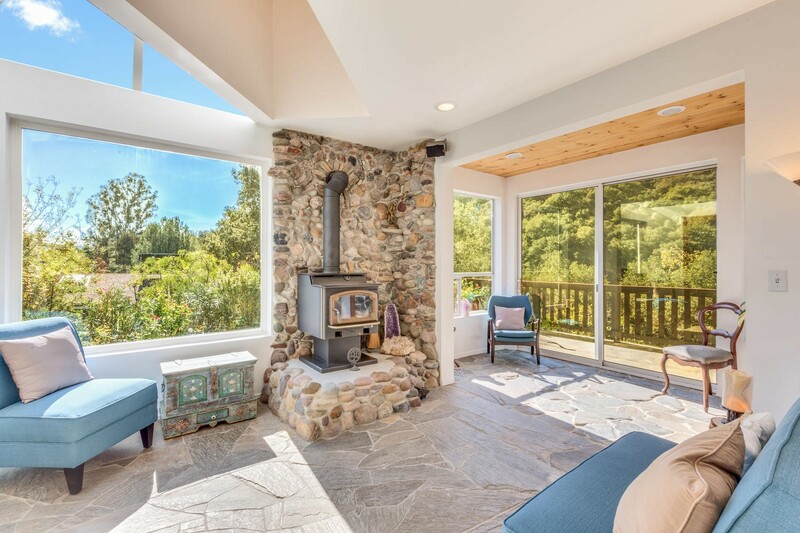 Skylights, windows + doors bring in the sunlight and are positioned to frame the natural surroundings. Multiple decks for taking in views, watching birds, and following the moon. Wolf/Subzero kitchen w/ warm birds-eye maple cabinets + blue lapis granite counters. Local river rock fireplace w/ energy efficient wood burning stove. All 3 bedrooms have full en-suite baths. This house is conveniently located yet peaceful + private, surrounded by mature trees, roses, organic veggie garden, waterfall w coy pond, + pretty patio areas. Well maintained throughout w central air/heat. For a Virtual Tour, please click here.